Official campaigning for Malawi's May 21 presidential, parliamentary and local elections has been launched on Tuesday in Lilongwe by Malawi Electoral Commission (MEC) where ruling Democratic Progressive Party (DPP) and opposition Malawi Congress Party (MCP) supporters were mocking each other with chants. The launch was held at Bingu International Convention Centre (BICC) in the capital city and supporters of all parties were in attendance clad in their colours. There was tension between supporters of the DPP and the MCP who were joined by their alliance partners People's Party (PP) of former president Joyce Banda and Freedom Party of former vice president Khumbo Kachali. The two camps booed some of the chiefs who were called to collect the Communication strategy for the campaign. And the MCP block which teamed up with UTM Party and DPP were also on each other wuth sarcastic songs for half an hour when MEC called political leaders to the stage of the auditorium. Demeaning songs were heard with DPP mocking MCP-PP alliance saying, "Chakwera, wakwera Joyce (Chakwera is in bed with Joice)." MCP and UTM also bursted singing, "Nkhuku yapanga chitopa" and "Neba, mutu sukugwila!" To crown it all the opposition taunted DPP with chants of Paulendo! Paulendo! [power is slipping on May 21]. The commotion led to a temporal suspension of proceedings to allow the tension to die down. MEC Chairperson Justice Jane Ansah cautioned the two camps to keep calm and respect the event. She told both DPP and MCP supporters that the event is a MEC event, not their respective parties' event. "If you continue we will open those doors and ask you to leave," Ansah said. Party leaders called their supporters to calm. Ansah said political parties are being urged to call their supporters to refrain from violence during the campaign period which will run for 60 days up to May 19 and elections. MEC has warned that police will arrest and prosecute anybody found using foul language and hate speech during the campaign period. Ansah has urged the police to ensure that all candidates are protected and that they should not spare anybody indulging in misconduct during the campaign period . 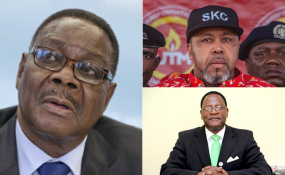 Incumbent President Peter Mutharika, 79, faces a stiff challenge from main opposition leader Lazarus Chakwera, 63 in the presidential election. Other main contenders are State Vice President Saulos Chilima, 45, of UTM Party and Cabinet minister Atupele Muluzi, 40, of UDF party. About 6.59 million voters are expected to vote this year, with over half of the eligible voters being youths and women.